it’s Thursday, almost Friday, so practically as good as the weekend. Let’s start day drinking…. no wait, I still have to work today, and tomorrow…BUMMER! I’ve already mentioned my 1:1 on-ramp training with my new trainer Jaz in yesterday’s post. Today I am going to tell you a bit more about the training. Focus of the session was to learn all the basic moves and exercises I need to know in order to participate in any WOD. Of course there’s so much more to learn but at least I know what I have to keep in mind during the exercises. Basic moves with the own body weight didn’t cause me any trouble. Besides pull-ups. I am crap at pull-ups! Then we moved on to basic moves with kettlebells and barbells. This is brand-new to me as I never really got into working with free weights. I almost always used the machines before. Okay but I learned to deadlift and clean and then we moved onto press-ups. I never felt that badass in my life. Loved it! Call me beast! I’ve mentioned before that we bought a new couch and wardrobe from IKEA. We were smart enough to get the stuff delivered as our car is certainly too small to bring only one of the things home. So we scheduled the delivery for my home office day. The time slot was between 7 am and 2 pm. I was already a little huffy that they couldn’t narrow down the delivery time any further but of course there was no other choice. Let’s say it went 10 am, 11 am, 12 pm, 1 pm, 2 pm and no one showed up. When the clock hit 3 pm I called the service line. I needed to talk to a stupid automatic service for 8 minutes until I was put on hold to speak to a real person. After 12 more minutes – I had already proceeded from #26 to #14 in the waiting loop – the delivery guy called me on my mobile and told me he was due 20 minutes. So past 3:45 pm the stuff was here. Maybe this was the redeeming time we first saved buying the stuff at IKEA! I was a little grumpy but that vanished when I saw the new couch! Love it!!! The perks of waiting for the delivery guy forever: We had not a single item of fresh food at home anymore and when the clock hit lunchtime is was basically starving. I rummaged the kitchen but all I found was breakfast food. Fair deal if you ask me. 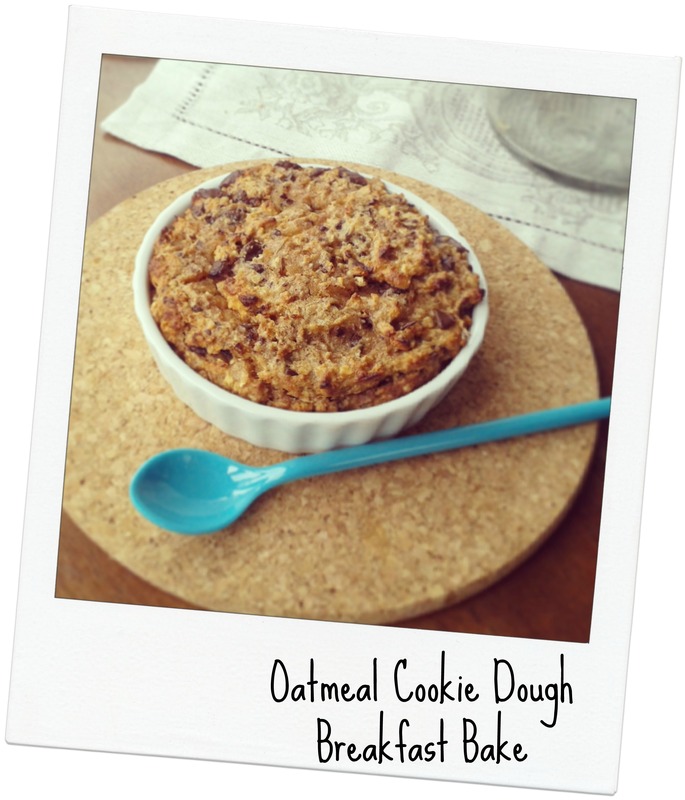 So I took the opportunity and made me a batch of Amanda’s Oatmeal Cookie Dough Breakfast Bake. If you haven’t tried it so far I would really recommend not to make it. It’s so good that you will basically never enjoy any other breakfast again! 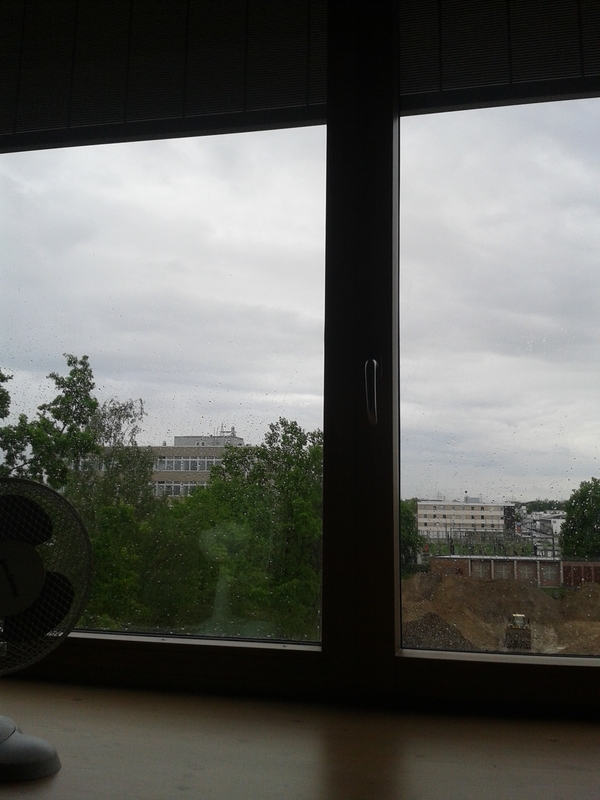 The automatic window shutters in my office are apparently still not fixed. In fact it even gets worse. It’s like this outside today. About every 5 minutes the shutters try to shut down. Yes it’s definitely almost blinding light in my office. So I have to get up and open them again manually. Very annoying. The problem is already reported to the janitor and she had called the housekeeping. So there’s a good chance we’ll have it fixed by September next year! The perks of working at a German university!!! We once waited 4 month for the dishwasher to get repaired and 5 month for the photocopier to work again. Not exaggerating here! Okay rant over – focused again. At least I have an excuse to get up every few minutes. My new credit card has still not arrived yet but we need to book accomadation and a car for the US. I am pretty sure that I told the credit card guy my net income to be my gross income so I expect my credit limit to be calculated too low – Bummer!!! Can I just call him to fix that? I have three assistants at work tomorrow morning. Goodbye quiet office! Haha my life is so complicated. Just like her’s! Ikea must be like that worldwide- Although our timeslot was 9-3 and they came at 5. FIVE. But clearly, it was a blessing in disguise…hello breakfast food?! Have you tried the breakfast bake recipe yet? Ugh having to wait for things to get delivered is a nightmare. And you know what’s even worse? Knowing that you -might- get a package on a certain day, waiting around forever, running out for 5 minutes to grab something, and then coming home only to realize that the postman came like 1 minute after you left. So.much.fail. That happens all the time! Once I waited for a package foreven and then I hopped under the shower for maybe 3 minutes and then I messed the delivery guy! So annoying!!! ha first world problems, I totally have to remind myself of that somedays. It’s just not all that bad and it always works out! I’m glad you love the new couch. Made it worth the wait. Plus Cross Fit is just all kinds of awesome.